"Some people are getting out of the habit of buying a newspaper every day. This offers them a fresh new choice. We have designed what we believe is a unique package that offers a genuine alternative to traditional Sunday newspapers." Newspaper circulations have been declining and Sunday's have been hit particularly hard. There are a number of potential reasons, but as argued 6 months ago, the Sunday Times cover price rise to £2 has not helped anyone's circulations. Consumers have less time than ever and more options for receiving information than ever before. It seems counter productive to keep producing ever larger papers and charging ever more money for them. A £2 cost in itself is not necessarily restrictive, but it is a psychological figure that seems to have encouraged re-appraisal of the Sunday newspaper buying for a number of people. This seems to have affected all the quality Sundays, not just the Sunday Times. The Independent On Sunday redesign aims to give a lighter Sunday paper for a lower cost. It also aims to promote further reading by tagging all of it's stories with web references and annotations. (The feeling is that the newspaper can be a gateway to other information sources, rather than the newspaper being an end in itself). My feeling is that it is a step in the right direction but doesn't go far enough. The tagging of stories and the presentation is innovative, and it might encourage more younger readers, however it does feel a bit lightweight next to competitors. Merging everything into one big newspaper or one big magazine may be also be a step to far for some - anecdotally people still like having seperate sections (particularly with Sport). Overall though change is good and the new look IOS has some appealing features both for readers and advertisers. I hope the public warm to it and other publishers also try to re-invigorate their products rather than prop them up with dodgy DVD's and random promotions! 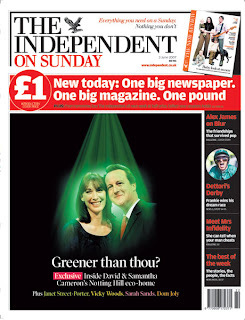 The Independent on Sunday was relaunched on 3rd June 2007 with a new, more compact design. The redesign aims to merge the news values of a traditional Sunday paper with production values of a weekly magazine. It now appears with a magazine-style front page, a full-page ad space on the back page, and digested news content linking readers to outside resources, such as websites. This more concise format has been developed to embrace modern, cross-media reading and browsing habits. The main section now comprises 96 tabloid pages covering news, comment, travel and sport. A separate business section, called 'Business on Sunday', also looks at money and media, and a single expanded 96-page colour supplement, called 'The New Review', provides art, music and film reviews. It also includes articles about food, drink, living and lifestyle, plus TV listings.